It's a dangerous world, and many people carry pepper spray for self-defense. If you're thinking about purchasing pepper spray, you'll want to weigh the benefits and available options. Pepper spray is an aerosol that contains capsaicin, the ingredient that causes the heat in hot peppers. Capsaicin is a skin irritant to humans and animals and causes severe burning on contact. When capsaicin is mixed with propellant and placed in an aerosol container, it can be sprayed on an assailant in self-defense, allowing you the opportunity to escape. Depending on the type you use, the spray is released as a mist, fog, or stream. Most pepper sprays have a spray range of up to ten feet, although some long-range brands spray up to 30 feet. Some people confuse pepper spray with mace. One reason is because Mace is a brand name that produces pepper spray products. Mace is a chemical irritant similar to tear gas, but it does not incapacitate a person to the extent that pepper spray does, especially if someone is under the influence of drugs or intoxicated. Most pepper spray is inexpensive. Several pepper spray options are available. Each offers various ways of carrying. A few varieties are obvious, and others can be concealed. 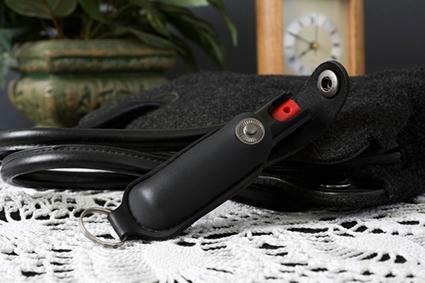 Keychain: Keychain sprays are popular choices because they can be connected to your keys or purse, making them accessible. SABRE RED offers police strength pepper spray with a quick-release keychain. Three color choices are available -- pink, red, or black -- for under twelve dollars. Lipstick: This pepper spray looks like just another tube of lipstick and has a range of ten feet. You can stay alert and ready to defend yourself without drawing attention. 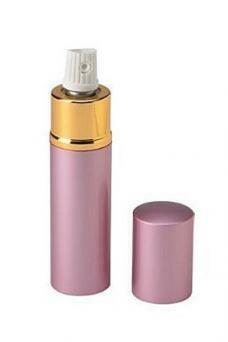 The spray is available in pink and costs under thirteen dollars. Bracelet: Little Viper offers a lightweight pepper spray bracelet that's easy-to-wear and not noticeable. Since it's on your body and ready-to-use, you save the precious seconds it would take to find if stored in your purse. It comes in pink or black for $19.99. Pen: The Streetwise pepper spray pen looks like an ordinary pen. It offers discreet self-defense and a UV marking dye to help identify assailants. Cost is $6.95. Canister: If concealment isn't an issue, consider a SABRE compact pepper spray canister. This spray is great to hold in your hand when you're taking a walk. It has a ten foot range and costs $6.99. Don't let the suspect get within arms' reach. Keep them at bay. Once you spray the assailant or animal, turn and run, and don't look back until you are away from the threat. Take the pepper spray canister with you. Use in the face area -- eyes, nose and mouth. Don't spray it close enough that it blows back on you. Make sure you know in advance the distance the spray will squirt. If you get the spray in your eyes, or you're a victim of being sprayed, try washing your eyes with milk or sour cream. "The best defense is awareness," says Sheriff Millholland. "Be aware of your surroundings and don't walk anywhere at night by yourself. [If you're attacked], yell like your life depends on it. It just might. But remember, you have to have contact to get physical. With pepper spray, you don't." Sheriff Millholland suggests pepper spray users also consider carrying wasp and hornet spray for self-defense. "It squirts 20 plus feet and will cause a blinding effect," he explains. "It works on all animals too. The bottom line is you want to render the assailant immobile long enough to get away." Pepper spray is legal in all states for use by people 18 and over, but some states have restrictions for purchasing and/or use. For example, in New York you can only purchase pepper spray products for humans from a licensed pharmacy or firearms dealer. Wisconsin restricts pepper spray to 10% oleoresin capsicum (the compound which contains capsaicin) and requires the device cannot be cammoflauged and must have safety features. Michigan stipulates human pepper spray contain less than 10% oleoresin capsicum. In Washington, D.C., pepper spray is legal, but you must register it with local law enforcement. Pepper spray used in self-defense should not result in an arrest. However, using pepper spray in anger or as a joke can land you in jail and/or result in a hefty fine. Some states, including California, have laws against pepper spray being carried or used by drug addicts or felons. Check with local law enforcement to learn about pepper spray regulations in your state. Pepper spray is a convenient, effective method of self-defense. Like any weapon, it's important to familiarize yourself with its safety and understand applicable laws. Says Sheriff Millholland, "You never know when you will be in a position that you need to have that little bit of defense to fend off a bad guy or girl. Pepper spray is a beneficial self-defense weapon."